Richard Tooker - The following information was gleaned from "personality sketches" - Am. 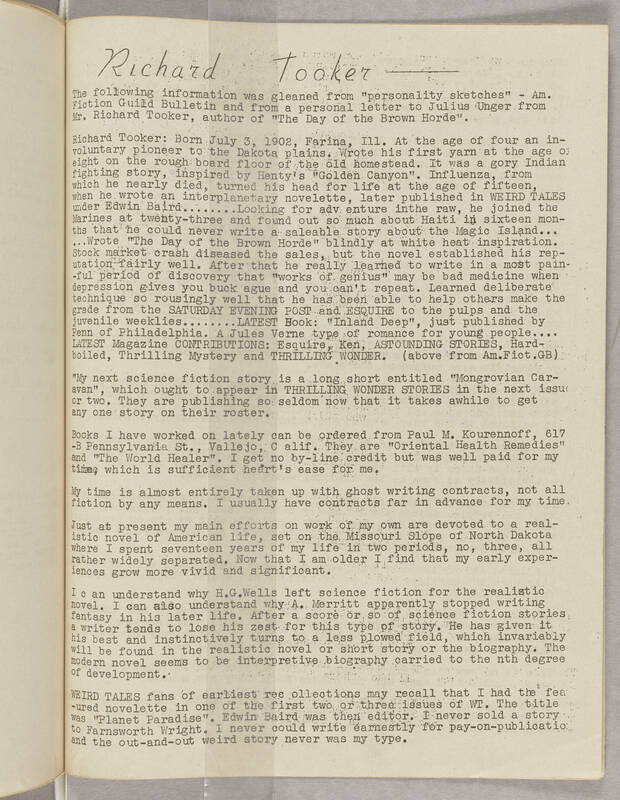 Fiction Guild Bulletin and from a personal letter to Julius Unger from Mr. Richard Tooker, author of "The Day of the Brown Horde". Richard Tooker: Born July 3, 1902, Farina, I11. At the age of four an in-voluntary pioneer to the Dakota plains. Wrote his first yarn at the age of eight on the rough board floor of the old homestead. It was a gory Indian fighting story, inspired by Henty' s "Golden Canyon". Influenza, from which he nearly died, turned his head for life at the age of fifteen, when he wrote an interplanetary novelette, later published in WEIRD TALES under Edwin Baird ........ Looking for adv enture inthe raw, he joined the Marines at twenty-three and found out so much about Haiti in sixteen mon-ths that he could never write a saleable story about the Magic Island...... Wrote "The Day of the Brown Horde" blindly at white heat inspiration. Stock market crash diseased the sales, but the novel established his rep-utation fairly well. After that he really learned to write in a most pain-ful period of discovery that "works of genius" May be bad medicine when depression gives you buck ague and you can't repeat. Learned deliberate technique so rousingly well that hes has been able to help others make the grade from the SATURDAY EVENING POST and ESQUIRE to the pulps and the juvenile weeklies ........ LATEST Book: "Inland Deep", just published by Penn of Philadelphia. A Jules Verne type of romance for young people .... LATEST Magazine CONTRIBUTIONS: Esquire, Ken, ASTOUNDING STORIES, Hard-boiled, Thrilling Mystery and THRILLING WONDER. (above from Am.Fict.GB) "My next science fiction story is a long short entitled "Mongrovian Car-avan", which ought to appear in THRILLING WONDER STORIES in the next issue any one story on their roster. Books I have worked on lately can be ordered from Paul M. Kourennoff, 617 -B Pennsylvania St., Vallejo, C alif. They are "Oriental Heath Remedies" and "The World Healer". I get no by-line credit but was well paid for my time, which is sufficient heart's ease for me. My time is almost entirely taken up with ghost writing contracts, not all fiction by any means. I usually have contracts far in advance for my time. Just at present my main efforts on work of my own are devoted to a real-istic novel of American life, set on the Missouri Slope of North Dakota where i spent seventeen years of my life in two periods, no, three, all rather widely separated. Now that I am older I find that my early exper-iences grow vivid and signigicant. I c an understand why H.G. Wells left science fiction for the realistic novel. I can also understand why A. Merritt apparently stopped writing fantasy in his later life. After a score or so of science fiction stories a writer tends to lose his zest for this type of story. He has given it his best and instinctively turns to a less plowed field, which invariably will be found in the realistic novel or short story or the biography. The modern novel seems to be interpretive biography carried to the nth degree of development. WEIRD TALES fans of earliest rec ollections may recall that I had the feat-ured novelette in one of the first two or three issues of WT. The title was "Planet Paradise". Edwin Baird was then editor. I never sold a story to Farnsworth Wright. I never could write earnestly for pay-on-publicatio and the out-and-out weird story never was my type.